← A Valentines Crazy Quilt block! I was determined to finish the Folk roses collection in time for Valentines Day this year. The last set has designs for extra large hoops that are at least 12″ by 8″ and will be released on February 10th, 2015. 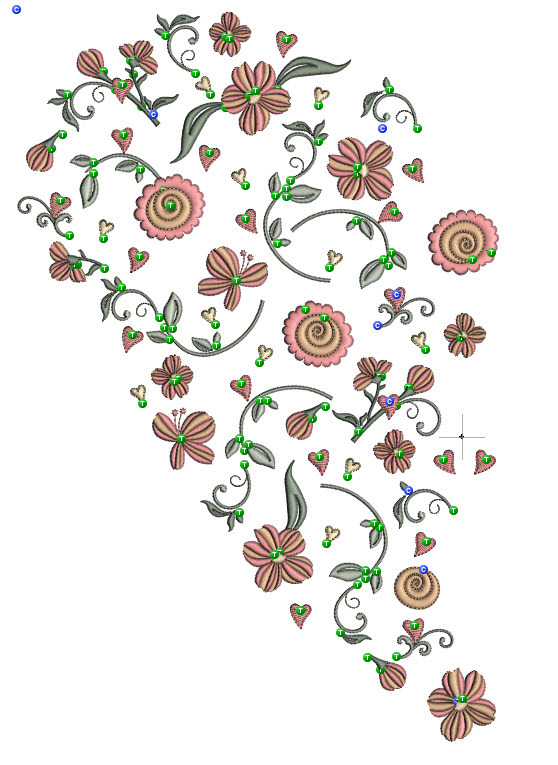 As I was creating these designs I saw the possibility of digitising a special design that when mirror imaged on itself would be a perfect heart. It would seem that no matter how large our hoops get for our wonderful machines, when I am designing they are never quite big enough to do what I want to do within them! 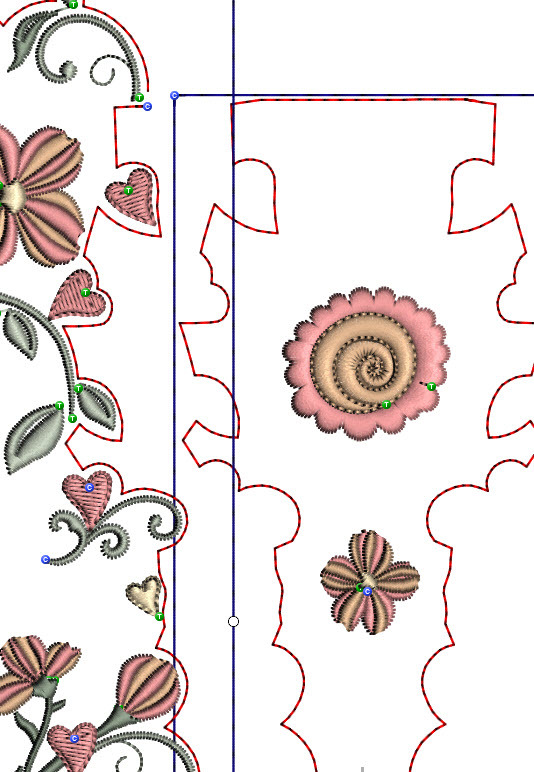 In the end I came up with a heart that looked like a pair of designs, so I decided to challenge you all and introduce a centre panel which would help blend the two designs. That also helped me make the heart just a little but bigger too! You begin with GFE-FKR-4-8-join and that is stitched in the centre of where the heart is going. The first set of stitches (red) will show you the outline of the design, marked Outline alignment stitches (OAS) The important thing to remember with these stitches is that they are stitched on just your hooped stabiliser. The outline that they make enables you to place your design accurately on your fabric. I use Temporary adhesive spray on my stitch and tear stabiliser and then attach the fabric. If your fabric is thin you will be able to see the stitches though the fabric but if not you will find you can feel them and see the impression they make. Of course lifting the fabric will also help you in the placement. If you do not want to use adhesive spray, you can pin outside of the stitch area and/or tack the fabric in place. Many machines have a basting facility that you can use to hold the fabric in place when you are happy with the placement. If your machine does not have this facility I have added a box of stitches for you. (blue) Once that has been stitched you can remove your pins if you have used them. Now you can stitch the flowers and the two hearts. When they are done remove the fabric from your hoop and trim away any excess stabiliser but do not remove the OAS that are underneath. Hoop your 12″ by 8″ hoop with stitch and tear again. Load up GFE-FKR-4-8-left in your machine. Notice that it has red stitches all around the design and a box of blue stitches. Upon closer inspection you will notice that the shape the red stitches make on the right pf the design matches exactly the shape of the OAS on the left of the first design. Here is a closer shot of the two designs. Obviously the red stitches have to be aligned perfectly. I have made these as big as possible so you can see exactly how the OAS work. When you stitch out the OAS on your hooped stabiliser you will be able match them to the original ones that were stitched out on your first design. Remember they are still there under the fabric on the stitch and tear. Lift and check that they are matching and use a pin if necessary. Place the pin through the same place on the fabric and on the hooped stabiliser. This process takes a little practise but once you have mastered it you will love the ease with which you can position your designs. It is so helpful to actually see the outline of a design! If you wanted to be absolutely sure you have done the positioning in the right place you could restitch a few of the OAS, but upon practise you will find this is not at all necessary. When the second design is embroidered out this is what it will look like. Remove the fabric from the hoop and remove any excess stabiliser but not the OAS! Re hoop for the third design, which is GFE-FKR-4-8-right, and stitch out the OAS stitches. 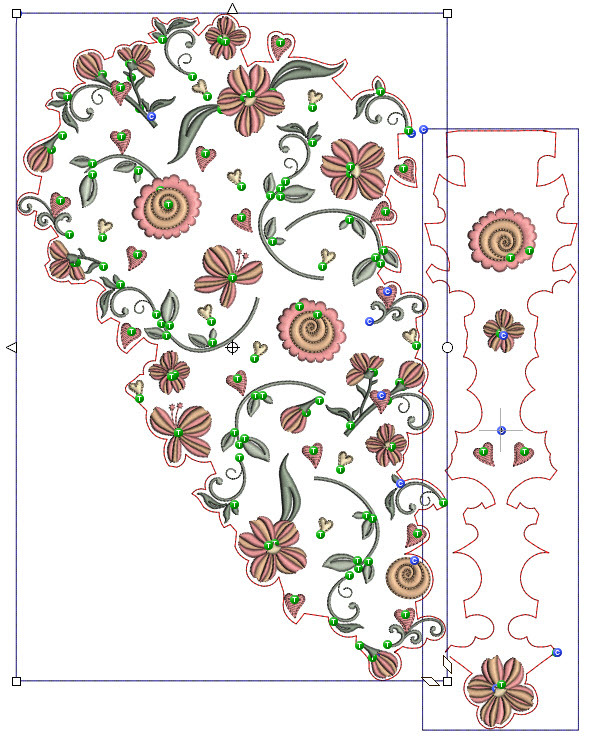 Here is a detailed section showing how the third design will slot into the middle design. Be careful to match up the OAS, attach the design with the basting stitches (blue) and then complete the design. The lovely thing about the OAS is that they make the removal of the stitch and tear so much easier as they have almost cut it for you! When you purchase this design set you will find more photographs of this procedure to help you. 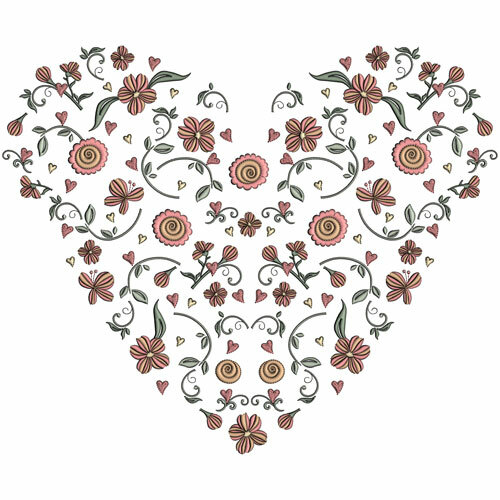 Use this heart on a special cushion for a loved one or embroider it on the back of a jacket! Of course you can always add some “bling” in the form of hot fix crystals or some lovely pearls. Now I think I have some pink pearls somewhere which would look perfect! 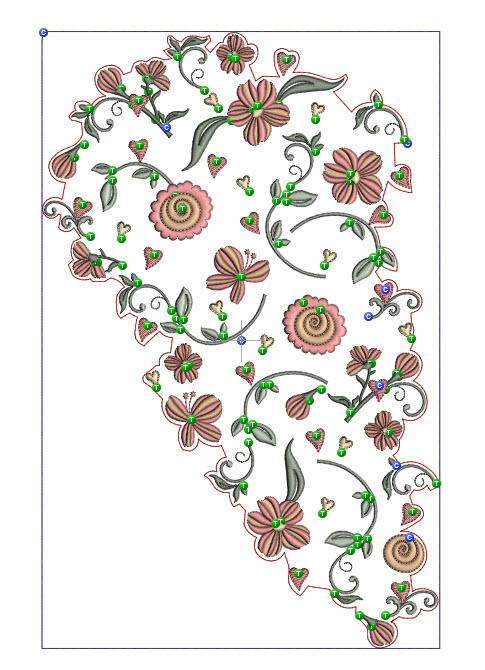 This entry was posted in Embroidery projects, New Designs and tagged Hooping only stabiliser, machine embroidery, Outline alignment stitches, Placement of designs, Valentines. Bookmark the permalink. 2 Responses to A beautiful Valentines heart full of roses! This heart is incredibly beautiful. So wish sometimes that my biggest hoop was more than a 5 x 7. Still it inspiring to see Hazel’s creativity.